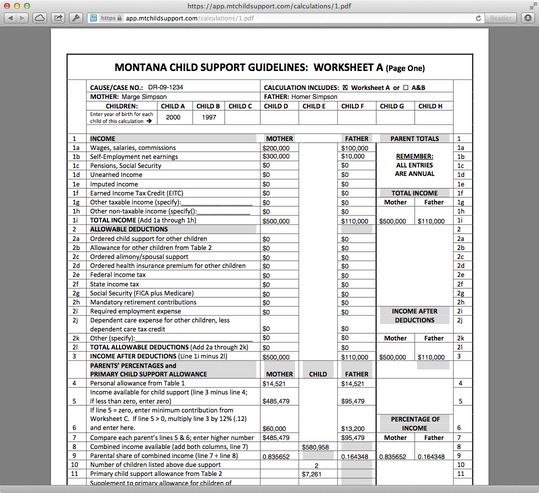 The Montana Child Support Calculator is the easiest way possible to create the correct court documents and ensure correct calculations. Period. Our system guides you through the complex and confusing process of creating a calculation. And we recognize that there are multiple possibilities that you may be considering. For that reason, we allow you to create as many calculations as you need for 30 days. Not sure if you’re better off letting your spouse have every weekend or every other weekend for child support calculations? Run both possibilities and find out for sure. Take the guess work out with our reliable formulas, and know you’re getting what you need with our Court Approved forms. Our easy to use system takes the guess work out of creating child support calculations, and lets you create dependable, reliable documents you can feel comfortable submitting to the Court. If you’ve ever tried to create a child support calculation by hand, you know the frustration of following bureaucratic instructions about math. In the best situation that would be hard. But when you’re children are depending on the results, it’s even worse. Our streamlined system skips all the confusion and just asks questions you already know the answers to. Questions about your family and your income. Not about your ability to do math. 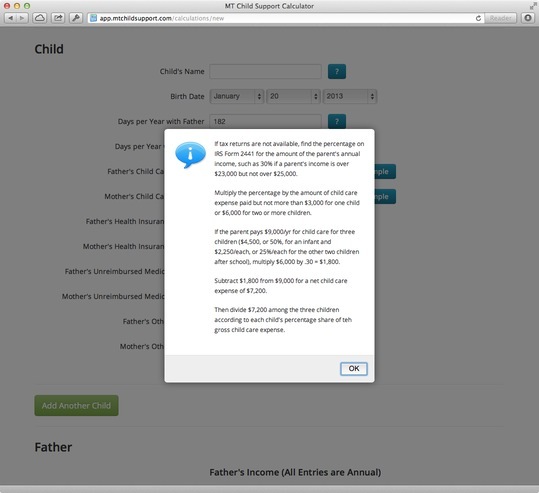 Using that information, we use cloud based servers to calculate your child support based on proven formulas provided by the state of Montana. These are the exact formulas Judges and Courts use, just in an easier to access format. So put away the pencil and eraser, give your calculator a rest, and let the Montana Child Support Calculator do the hard work. And best of all, you can use it again and again to try all the combinations of parenting arrangements you’re considering. There’s no waiting, there’s no guessing, there’s just calculating. Even for the pros, child support calculations require a lot of information. That’s why we provide help for every question our system asks. Next to each input, there’s a blue box with a question mark in it. Just click that box and you’ll immediately get guidance to help you know exactly what is being asked. No more searching through a pile of papers for the instructions sheet, or calling your friend who did a calculation a few years back, just help – right when you need it. On top of that, we offer computerized estimators of certain parts of the calculation. For example, the guidelines ask you to provide your spouse’s income tax amount for the past year. If you’re not on great terms with your ex, that could be difficult. 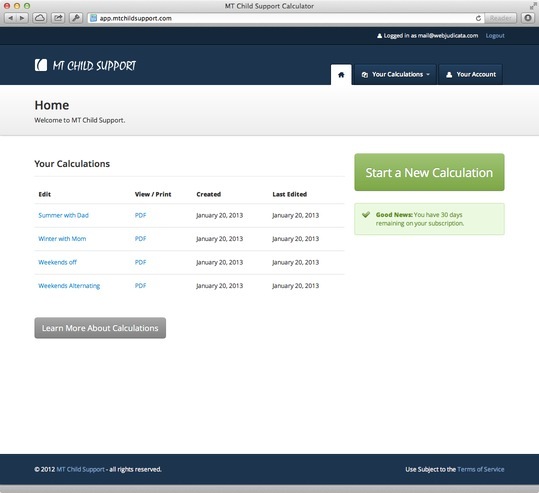 So we make it a little easier by offering an automated estimation of their tax liability. A court approved short-cut – what more could you ask for? If your legal case requires you to file a child support calculation with the Court, you want to do it right. But knowing which documents are required and how to fill them out can be confusing and frustrating. We take the guess-work out of the process by providing you an easy-to-print PDF of exactly what you need. Answer our questions honestly, let our systems do the calculation, and be sure that you’re providing the Court with the proper documents. Our experts worked hard to streamline the process and avoid any extra work on your end. We don’t give you confusing instructions about Worksheet-B which may or may not be required. Instead, we just give you what you need – and only what you need. Hit print and you’re ready to go, and you can rest assured that the proper documents are included with your calculation. 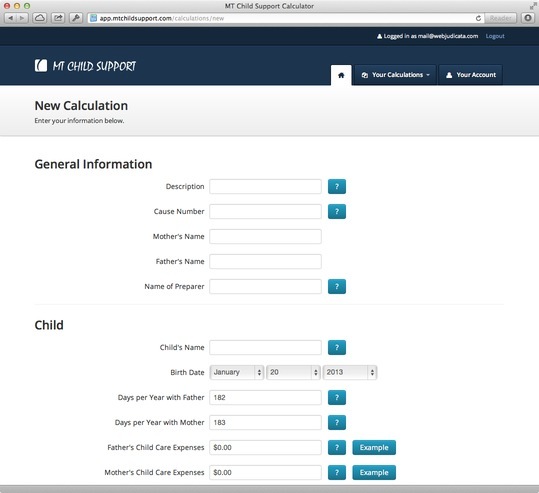 Get the child support calculation you’re entitled to, and present it to the Court the right way. That’s what we offer. So what are you waiting for? If you’ve got more questions, click here to contact us.